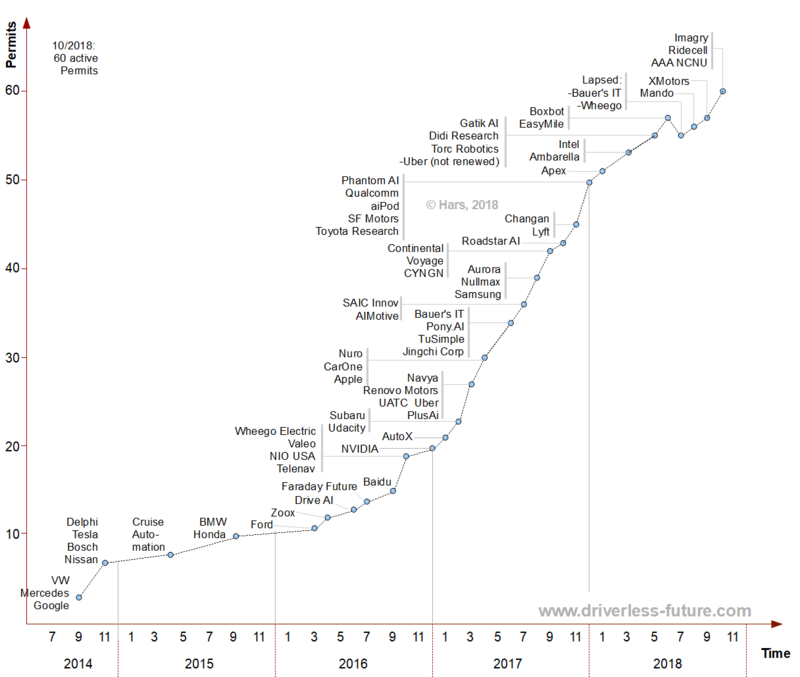 Since 2014, many companies have applied in California for testing self-driving cars. The list of companies which have received a permit can be used as a measure for the innovation process associated with autonomous vehicle technology. The graph below shows how the number of companies active in California has only increased gradually from 2014 to the third quarter of 2016. A steep increase follows in 2017. The slope softens in the first half of 2018. Of course it would be premature to conclude that we are already seeing the beginning of the end of the S-curve which is so typical for innovation processes. And the California AV permits can only be seen as a proxy for the larger distributed self-driving vehicle innovation process currently unfolding across the world. – 58 permits have been issued by the end of June 2018; One permit has not been renewed (Uber), making it 57 active permits. The graphic is updated from time to time. You may need to reload your this page in your browser to view the current version of the graphic. -2018-11-18: By the end of October 2018, the number of active permits increased to 60. – 2018-09-07: By the end of August 2018, Mando America Corporation received a permit, increasing the number of active permits to 56. – 2018-08-07: By the end of July 2018, 2 companies did not renew their permits (Wheego Electric and Bauer’s Intelligent Transportation) reducing the number of active permits to 55.